On 4 May 2017 Dr. Andreas Drees passed away at the age of 62 after a courageous battle with cancer. In 1981 Andreas Drees took over the surveying office from his father and acted over decades successfully as publically appointed surveyor in Münster (Germany). 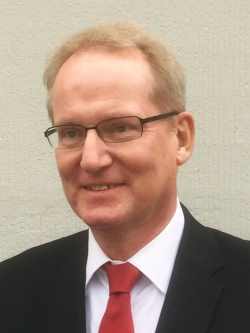 During his entire professional life he was in addition active in BDVI (the German Association of Publicly Appointed Surveyors) and DVW (German Society for Geodesy, Geoinformation and Landmanagment) in various positions. The international community remembers Andreas very well as FIG Vice President from 2003 to 2006 where among other duties he was responsible for the coordination and guidance of the 10 FIG Commissions. Some years ago his son Thomas became his successor in his company. Our thoughts are with his wife and his children.